Custom golf cart seats are not just about golf cart seat covers, but also about comfort. I started talking with a new golf cart owner who had a top of the line golf cart, brand new, just bought it. On her seat she kept a pillow. She told me how much she loved riding in her new golf cart, but her back didn't. She was trying to support her back with the pillow and it wasn't helping much. I can relate. We bought a newly refurbished golf cart this fall with new wheels, new tires, new batteries and new golf cart seat covers. While it looks great and runs like a top, it's not all that comfortable. I realized that my back was hurting after taking the golf cart back and forth to work. That's when I started looking into different golf cart seat options and found Ultimate Golf Cart Seating. Ultimate Golf Seating has revolutionized golf cart seating. Though a few competitors have attempted to enter this high end market, none have been close to imitating the superior style, comfort, ergonomic support and quality that is crafted Into the Ultimate Golf Seat. Ultimate Golf Seating is the original and only producer of such superior golf cart seats. 1. What features do your custom golf cart seats offer that makes then stand out from other custom seats? Ultimate Golf Seats are made using only the finest materials, superior to other custom seats in style, comfort, ergonomics, and quality. We’ve set out to build seats that live up to their name: Ultimate. When you have an Ultimate Golf Seat, you have the best seat available for your golf car. 2. Discuss what makes your golf cart seats so comfortable. Where others may opt for a cheaper molded foam, each of our seat models is constructed using high-end, furniture grade cut foam. This gives our seats a plush comfort that also lends ergonomic support where it’s needed most. 3. Explain the ergonomical benefits of your seats that help support the hips, the back and the neck. High quality polyurethane foam lends to superior comfort, while the design of our seats focuses support in the areas that need it most, the hips, back, and neck. 4. Are your custom seats only available for 2 passenger golf carts or can they be used as rear facing seats on a 4 passenger golf cart. 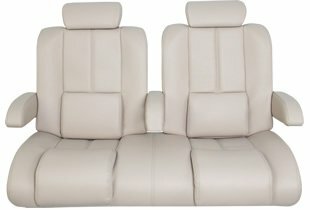 We offer a matching rear seat that is more of a bench shape. This allows a rear flip-seat to still function. 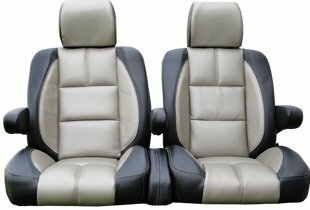 Our rear seats are styled similarly to our front seats, using the same premium materials and similar sew patterns. 5. Can your seats be used on any golf cart make, model or year? We fit most major brands and makes; Yamaha, Club Car, E-Z-GO, Tomberlin, Star Car, Polaris, and Alumacar years 2000 and newer. 6. Tell us about the durability of the seats from the foundation to the quality of the seat fabric. Do your seats come with any type of warranty? All Ultimate Golf Seats come with a 1-year warranty. Our seats are built on a 3/4” pressure treated plywood base and utilize a ¾” e-coated steel superstructure to ensure there is no rusting or warping over time. 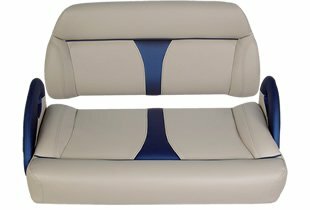 We use high density foam to prevent breakdown over time and use high-end marine grade to wrap the seat in. This gives the seat a nice plush look and feel while ensuring it holds up to rain other elements. 7. 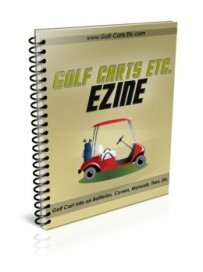 Can a golf cart owner install the seats themselves or does it need to be done by a golf cart repair shop? Installation is fairly simple and can be done by a customer themselves right at home. We do recommend having a friend help as the seats are heavier than stock models and installation is very easy with two people. 8. How do you recommend cleaning the seats? Common dish soap and water work well for everyday cleaning needs. For stubborn stains 409 cleaning formula works really well. 9. Can seat belts be installed and work with your seats? Seat belts work with all of our models with the exception of the Luxury Bucket. For details regarding specific types of seatbelts call our toll free number. 10. If a person is interested in ordering ultimate golf cart seats for their golf cart what's the best way to contact your company? See your local dealer, many dealer’s nationwide are now carrying Ultimate Golf Seats.